at Synchrony Bank's Secure Site. 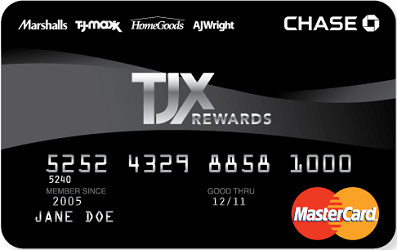 TJX Rewards Credit Card is offered by T.J.Maxx Company. This company is the number one retailer in U.S and the world as a whole. It has several stores located in Canada, Europe, and Australia as well as in U.S.The company has a mission of providing high value to their customers via the services they lender to them. It has managed to reach a broad range of potential customers worldwide due to their flexibility. In addition to new store and online growth, they are intelligent risk takers, always testing new ideas in merchandise categories and other initiatives that help them expand their business. The company also considers balancing their growth with investments to lay a strong foundation that will position them well for the future. The company also provides a TJX Rewards Platinum MasterCard. The first can only be used at T.J.Maxx and some affiliated stores, while the second can be used anywhere MasterCard is accepted. For making the purchase with the company, each card earns you an extra reward, and you stand a better chance of benefiting from the shopping benefits offered by the company for using the card in transactions. The two cards have many advantages which are accrued to eligible users. The first gain of these credit cards is that immediately an account is opened, there is a 10% discount allowed for the first in-store purchase. The credit cards also give Cardholders special shopping hours and can as well provide surprise and delight benefits throughout the year. They also contain price protection that gives out reimbursement in case the item purchased is being advertised with a lesser price soon after you buy it. The company also provides up to one year warranty for eligible purchases. When the cardholder’s identification happens to be compromised, the cards provide an Identity Theft Resolution service which assists in resolving that. When you spend your money transacting in T.J.Maxx, HomeGoods, and Sierra Trading Post as well as Marshalls, you are accrued to 5point in each dollar you spend. There is also an extra point earned on all the purchases that you make, and the amount of rewards that you can earn is limitless. By spending the certificate, you are eligible for obtaining a 5% discount, and there is a $10 bonus received for 1000 points earned. People having fair credit can earn an interest of 26.99% with both TJX Rewards Credit Card and TJX Reward Platinum MasterCard, but with the TJX Rewards Platinum MasterCard, a 26.99% cash advance is also charged. However, the high APR’s of 26.99% make these cards a bit dangerous when it comes to revolving balance. You’ll want to pay off your balance each month to avoid incurring the interest charge, which will quickly make that 5% discount seem quite worthless.The TJX Reward Credit Cards are however better to use, and they can earn you more credits than you expect. Rewards for every single dollar you spend. 1,000 Rewards Points = $10 Rewards Certificate. Get 10% off your first online purchase with your new TJX Rewards® Credit Card only at tjmaxx.com.